We are looking for great leaders like you. We believe young people like you change the world. With your help leading our Vermont Farm and Conservation Crews, we will spend this summer and fall growing food for those in need and improving the health and accessibility of the outdoors. Apply Today! Apps are due May 1, 2019. We are looking for young people 20 years old or older to lead our youth crews (15-18 year olds) and young adult crews (18-26 year olds). As a Crew leader, you’ll work on our farm crews in Richmond or Newport or on our Conservation camping (Spike) or Community (daytime) Crews across Vermont. Get paid to work outside on long-term or summer crews: April until May on spring peer crews; from May until August; or from May until October; or a combo of our seasons (March until October). Positions are filled on a rolling basis, with preference given to early applicants. Questions? Email Pilar for Conservation or Kyle for Farm. Leading a crew is an adventure unlike any you’ve ever had before! As a teacher, work supervisor, and a role model, you will be responsible for building a community, ensuring your crew’s health and safety, and teaching life and job skills. By professionally managing your work project and ensuring high-quality standards, you’ll stretch your comfort zones and bask in the sweet rewards that follow. Crew Leaders have a passion for leading a crew of Crew Members who are between the ages of 15 and 24 and from all walks of life. We hire Crew Leaders and Members of varied interests and talents, representing many social, economic, and geographical backgrounds. The combination of a diverse crew, excellent leaders, and high-priority conservation projects creates a dynamic and educationally rich experience. Are you working on your leadership skills? Hoping to hone your skills a bit more before taking on a Team Leader position? An Assistant Crew Leader position is just for you. Our Assistant Crew Leaders work along side a Crew Leader to help guide and mentor the crew throughout the summer. This is the perfect opportunity for someone who is looking to gain more experience in a leadership role. No matter which leadership role you’re in, you start the season with paid staff training during which we will focus on teaching both technical and interpersonal skills needed to be a successful leader at VYCC, while also drawing out your own strengths and enhancing your existing skills. You will use what you’ve learned to transform your crew from a varied group of strangers into a tight-knit community. AmeriCorps positions earn an AmeriCorps Education Award upon successful completion. Health Care and Dental Insurance, for Long Term Crew Leaders (May-Late October)! Are you a returner? You may be eligible for our Simple IRA! Farm fresh food from our organic farm. One week session breaks (every 4 weeks), which include 2-3 days off to play in Vermont! Discounts and pro-deals at some of your favorite retailers including, Prana, Red Ants Pants, Lenny’s Shoe and Apparel and many others! Access to our robust Alumni network for networking and future adventures! We are looking for young adult leaders who are ready for a challenge and enjoy working with youth or their peers as teachers, mentors, supervisors, and role models. Excellent leadership is the most crucial factor in determining a crew’s success. The level of professionalism, motivation, and sense of community on the crew is a reflection of the strength of the crew’s leadership. This AmeriCorps position, works alongside a Crew leader, hone your leadership skills, a true experiential learning opportunity. Guide, mentor and coach a crew with a Co-Crew Leader for our summer and fall sessions. Dates: May 22 until October 29. A crew is made up of six to eight youth or young adult Crew Members that work and learn together. Crew Leaders will lead either a Community Crew or a Spike Crew. Community Crews work during the day at their work site (7:45 a.m.-4:30 p.m.) and crew members head home at night. Farm Community Crews (youth or young adults) work Monday through Thursday on our Farm at VYCC or on the Bluffside Farm in Newport. Conservation Community Crews work Monday through Friday in Burlington, South Burlington, Williston, or Woodstock. 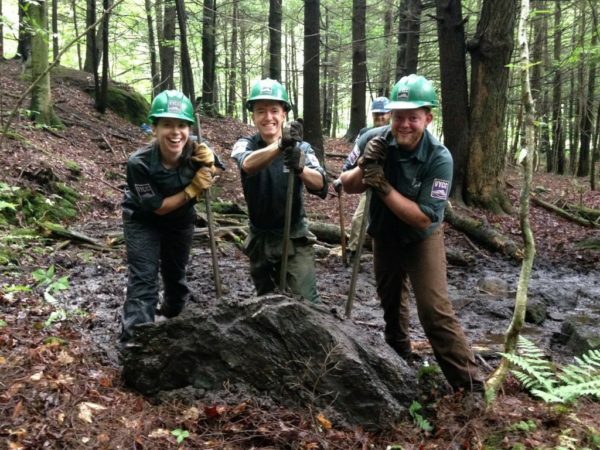 Spike “camping” Crews (for youth or young adults) live together, camping near a work site and work during the day (7:45 a.m-4:30 p.m.) in Rutland, Lamoille and Washington counties, the Dorset area, the Long Trail, the Appalachian Trail, and in many state parks around Vermont. Some of our Spike crews are AmeriCorps Member positions, which means Crew Members are earning a living stipend and an educational award. VYCC fills Crew Leader and Assistant Crew Leader positions on a rolling basis beginning as early as the fall that precedes the next season. Preference is given to early applicants. Can you start in the spring? 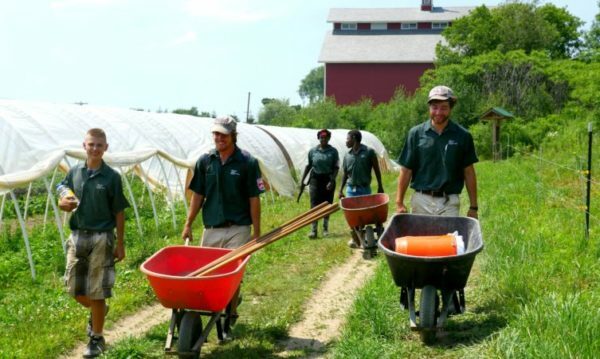 Conservation and Farm programs both offer spring time position opportunities for Crew Leaders. Farm: Long Farm Project and Team (“Crew”) Lead start March 1 and April 1, 2019. 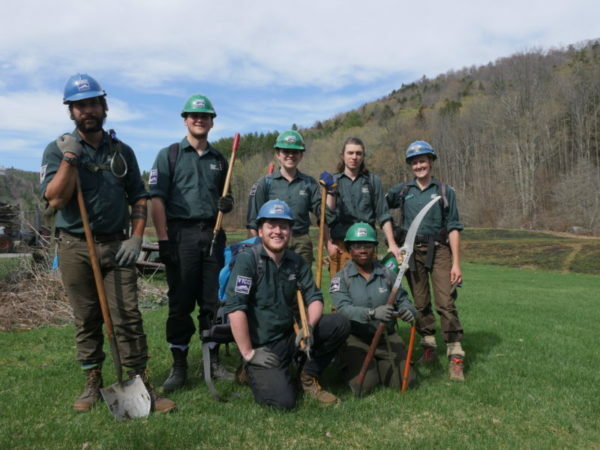 Conservation: Spring Peer Crew: April 17 until May 20, 2019 (rolls into Crew Leader Training). A desire to do your part and change the world with us. Previous experience leading young people and/or in outdoor work. Openness to learning, working hard outside, meeting new people, and receiving feedback. Willingness and commitment to following all immediate and general crew policies. Good driving record and a valid driver’s license held for at least three years. Apply now! Apps are reviewed on a rolling basis and due April 15. Email Pilar for Conservation or Kyle for Farm.